We are pleased to report that all six seal pups are doing well and improving daily. 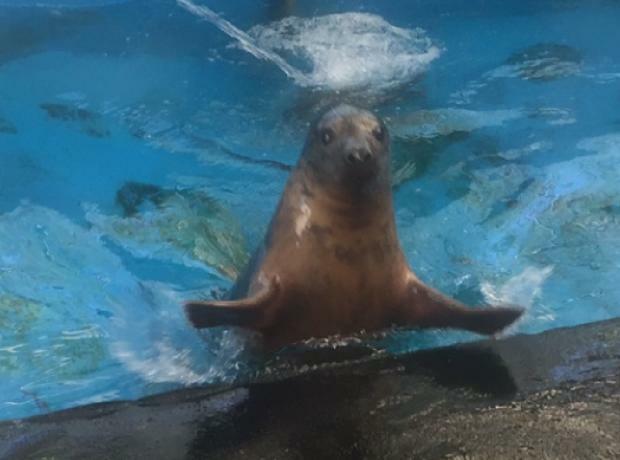 In fact when there is a break in the weather we are hoping to release Marty the grey seal pup back in Jersey where he was rescued. The weather however is playing havoc with the fresh fish we require for the seal pups and despite deliveries in bulk with the sustained bad weather we have had recently our stock is starting to run low. The GSPCA is currently appealing for fish caught in the last 3 months, ideally herring or mackerel but any whole sea fish would be much appreciated. Last month Andrew was rescued starving and dehydrated. 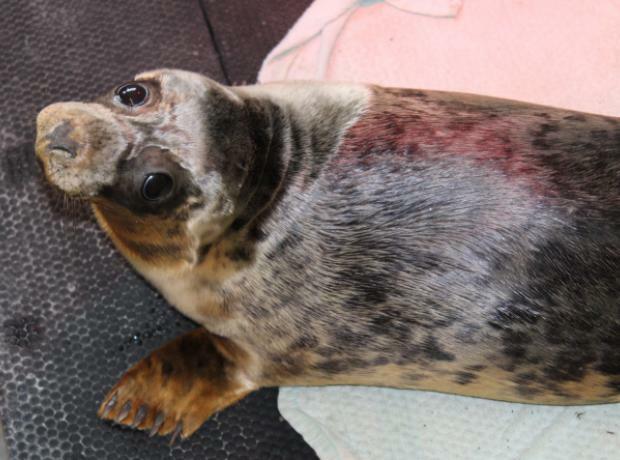 Found on a beach in Jersey this very poorly seal pup is lucky to still be alive. Andrew is till very weak having been found only a couple of days old and in such a bad condition and the GSPCA team are working around the clock to do all they can for this very poorly grey seal pup. Having had a series of treatments and fluids we are now appealing for donations of mackerel and herring. This lunch time the youngest grey seal pup to arrive at the GSPCA in many years arrived from Jersey. Andrew as the pup has been named still has his white fluffy coat which is lost at 14 days of age, making him around 7-12 days old and at only 17kg he is painfully thin. New marine mammal medic Martine Venton-Heys who helped with the rescue in Jersey yesterday accompanied Andrew who is being shown around the GSPCA while she waits for her flight back to Jersey thanks to Blue Island who helped provide the transport needed. Yesterday Iris a grey seal pup at just 15kgs arrived at the GSPCA which was the most unseasonal grey seal pup the GSPCA had in their care. The pup when she arrived was incredibly emaciated and the team were extremely concerned for her condition and the reasons why she was so thin at this time of year. Despite the vets out yesterday on a number of occasions and the care of the team at the GSPCA Iris was fitting which was of huge concern and despite treatment she passed away in the early hours of this morning. With only a matter of weeks before Temperance the seal pup is planned to be released the GSPCA received a seal pup from Jersey in the early hours of this morning. ‘Iris’ as the grey seal pup has been named, was rescued yesterday in Jersey which is completely out of season to when grey seals are born and are rescued. This morning the GSPCA have been devastated to find that Rocco the Jersey grey seal pup who was rescued on Sunday by the BDMLR team, arrived in Guernsey on Tuesday and has been under the care of the team and the vets passed away in the early hours of this morning. 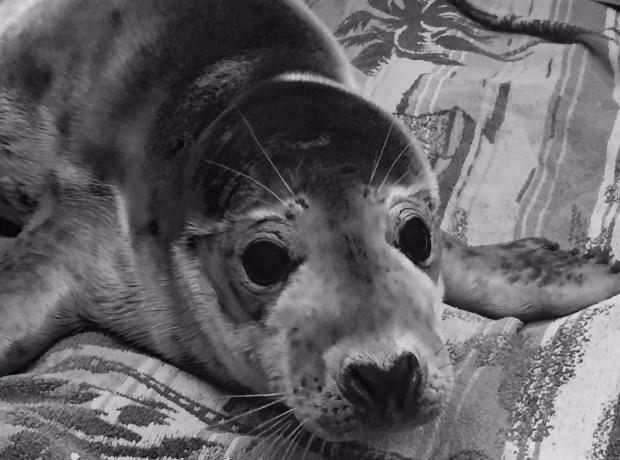 Rocco was rescued the same afternoon that Sami the Jersey seal pup was released back in her home waters. This is the first ever grey seal pup the GSPCA has had rescued and come into care in the middle of the summer which is extremely unseasonal and never been seen before.